West Dyke currently goes underground at the edge of the A174, an area now prone to flooding. 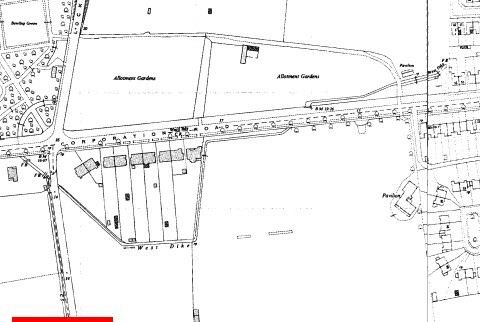 An open stream is shown here on 1970s maps and until recently the top of Oxgang Bridge was still visible at the edge of Plantation Road, although the parapets have since been removed. 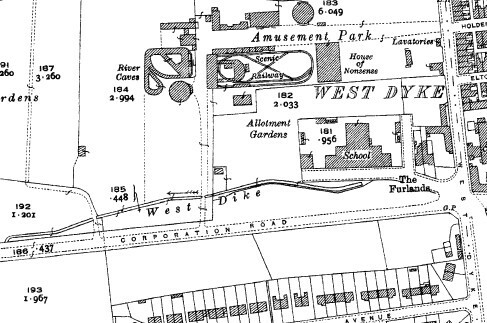 A sharp westerly turn is taken at the end of Thrush Road, and in the 1930s it came back to surface alongside Corporation Road, this area must have been culverted when Sandringham/Buckingham Roads were built. The water re-emerges in Locke Park with an identical concrete bridge to the one on Corporation Road, so they most likely both date from the opening of the park in 1929. Virtually the full length of the culvert remains under footpaths, presumably in case of collapse. Amazing stuff,love reading these.Good work that man ! Potentially 2 miles of culvert, i wonder how far up you can get ? Very interesting. Will have to check this out next time I am in Redcar consuming a Pacitto’s ice-cream. Get yourself up there. It also says “river caves” on that map. What does that mean? Its the old amusement park. Here’s a picture of the ‘River Caves’ referred to on one of the maps. Not the real thing more’s the pity!